Our cuticles play a very important role on our fingers. They protect that tender part where your nail attaches to your finger. Cuticles can become damaged if you work a lot with your hands, wash them often, or are naturally prone to dry skin. They can then become dry, cracked, and ragged. Often times people will pull, tear, or clip their cuticles instead of just gently pushing them down and moisturizing them. That’s really all you should be doing. You should be able to gently glide a cuticle tool or your thumb nail along the base of your nail where it meets the skin, then gently scrape away any dry skin that is left unattached on your nail. Now, anyone who is really close to me would tell you that my nails aren’t the prettiest all the time. I am constantly digging in dirt, washing something, or using my nails like a tool. Not great for healthy nails. So occasionally I have to use a deep conditioning treatment to get them back under control. I hate the pain that goes along with hangnails, cracked cuticles, or dry hands. It’s uncomfortable, can really hurt, and can even bleed. Why are your hands like this? Are you washing your hands constantly? Do you work outside in the winter? 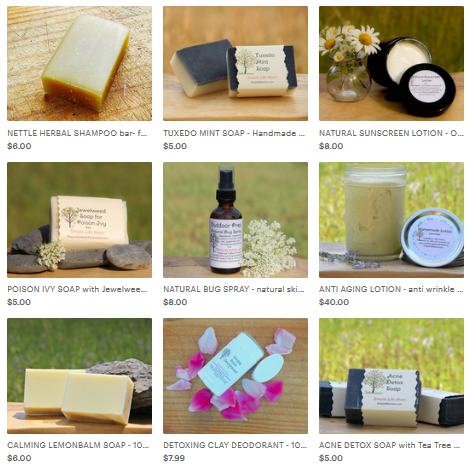 Do you naturally have dry skin? You want to get an idea of why they are cracking so that you can work on preventing it in the future. You may need to wear gloves, or keep moisturizer by your sink or by your bed. 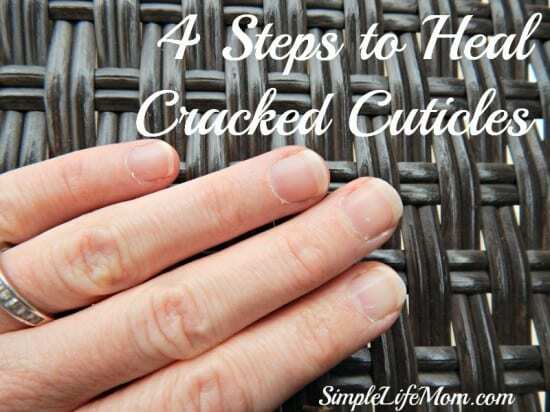 If your cuticles are seriously cracked and bleeding, then they need some serious care. Place some Homemade Antiseptic on them and wrap in a band aid overnight. This will kill all germs and keep them moist so they can begin to heal. If it’s winter, wear gloves the next day as you go out to prevent them from drying out too much. You want to keep them soft until you can do the next few steps. Rub into fingers for 10-15 minutes. Repeat 3 times per week until fingers are healed. 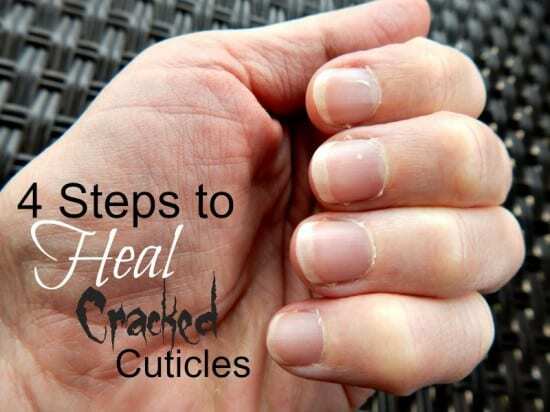 Try some or all of these steps to understand what’s going on with your hands, and then address the issue of cracked cuticles. Stop them before they get painful and you’ll be a lot happier! Thank you. I struggle with this, but part of my problem is…picking. I don’t typically bite, but I pick. I find when I rub on oil instead of pick, they begin to heal. I will try your solution and see if it helps! It’s so easy to make sores when you pick. I used to. I think the oil makes them look and feel better so you don’t feel like you need to pick. It softens them so they don’t tear bad either. I am always working in the kitchen: cooking and cleaning! So my nails aren’t the prettiest either. Thanks for the homemade solution! Thanks for stopping by Carrie. Great idea! Thanks for sharing on the Homestead Blog Hop, hope you’ll stop by again this week! Thank you for these tips! My cuticles get cracked like this when it’s cold out. 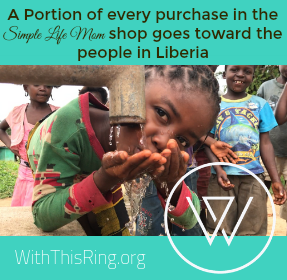 Thank you for sharing this with Hump Day Happenings. This is something I would have never thought of. How clever! I don’t have a working dishwasher, so use gloves and a dish soap filled sponge on a stick to help keep my hands soft, though I have struggled much with dry, cracked hands over the years. One of the things that has helped a great deal is to take cranberry juice supplements. I would have to try these tips, thank you, what has worked for me in the past is a balm from sunnyqnyc it helped me immensely with with dry hands and cuticles but it’s expensive so i am looking for a cheaper alternative. Yes, doing it yourself usually ends up a lot cheaper. What skins of Shea butter is a great mind? Dose it matter what kind of I have to get. Unrefined is best, but you’re mainly looking for shea butter that has no other ingredients. Thank you for this easy trick to keeping nails soft and healthy! I deliver mail: working with paper products, which tear at the nails, then going into freezing or wet weather and handling that same paper….not good for nails!!! I often will get those horrible ‘trenches’ on the fingertips from cracking skin. This is a great routine to get myself into to keep my nails from cracking and bleeding so much. Where do I find the Apricot Kernel Seed Oil? If you have a GNC near you or a health food store they usually carry it. Otherwise you’ll need to buy it online. My cuticles are constantly dry, brittle, and sore. I get hangnails and then bite and pull at them until they rip and bleed. The tip of my thumb right at the nail has split open and is very sore. I can’t seem to get it to heal as it is in constant use. What can I do to prevent this cracking? I’ve just started using shea cream and rubber gloves when my hands will be in water. Thanks for suggesting products that don’t cost me a fortune. oh cracked cuticles are so painful! I can’t wait to try this out!